November 17-December 31, 2017 During this year's holiday season, Auto Club Speedway will transform into a holiday spectacle with the Magic of Lights, a dazzling 1.5 mile drive-through holiday lights experience featuring more than 400 spectacular displays using the latest LED technology and digital animations. Tickets will be $20 per car in advance and $25 per car at the gate. One Carload, One Price! 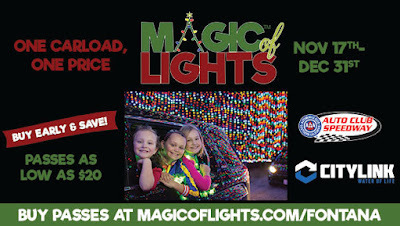 A portion of the proceeds from the Magic of Lights will benefit CityLink.